Is an Ordinary Glass Door a Dangerous Condition? Here in Florida, with all of our wonderful views, glass doors can be found in many homes, apartments, condos, as well as in the majority of commercial businesses. Stroll along any of our many business areas in South Florida, and you will be hard pressed to find an establishment that isn’t filled with glass windows and doorways to maximize views of the palm trees and the blue Atlantic. However, from a personal injury standpoint, every property owner with a glass door must understand that there are special legal duties that come with having a door made from this material. This is true for residential property owners as well as those who own or operate commercial premises. What is a Dangerous Condition? Under Florida law, some property conditions are known as dangerous conditions – conditions which are viewed as inherently dangerous by their very nature. When there is a dangerous condition on a property owner’s premises, it means that there is a condition that might cause someone to get hurt, such as a wet floor that can lead to a slip and fall. Florida law places a legal duty on the owner or occupier of these premises to warn people of this risk of harm. Additionally, businesses with dangerous conditions must tell customers and clients there is this danger and take reasonable steps to keep them safe. However, glass doors are not always considered dangerous. Meaning, there may not be a duty to warn imposed on the property owner(s). Is this sliding glass door inherently dangerous? When is a Glass Door a “Dangerous Condition” under Florida Law? Glass doors have been popular with architects and builders since the mid-twentieth century. Over 20 years ago, the Florida Supreme Court established how these popular entrances will be treated under premises liability law. A test has been created which must be evaluated against the specific circumstances of each glass door accident injury claim. the activity on the premises. See: Fitzgerald v. Cestari, 569 So. 2d 1258 (Fla. 1990). These conditions apply to glass doors found in both residential and commercial real estate. Not all glass doors are made the same. Different kinds of glass can be placed into sliding glass doors, as well as French doors, floor to ceiling windows, and decorative front doors. In sliding glass doors, something called tempered glass, or “safety glass,” may be used. Using this type of glass is beneficial, as it is a safer kind of glass in the event of breakage. Tempered glass crumbles into small bits and pieces with enough force. Ordinary glass doors that are not tempered will break into large, sharp shards. These are very dangerous. Large pieces of broken glass can fall from the door upon impact, and while other jagged edged pieces remain in the door frame. Unfortunately, it is not possible to distinguish between regular glass and safety glass just by looking at the door. In the Florida Supreme Court case of Fitzgerald, the law regarding glass doors as dangerous conditions was established. The case began when 7 year old Brandi Fitzgerald was visiting her grandparents. They lived in a house situated right behind the Cavanaughs, and the neighbors were friends. On the day of the accident, Brandi was visiting the Cavanaughs’ home. It had a sliding glass door that opened to the back yard. That afternoon, Brandi had been playing in the Cavanaugh’s front yard and it was time to go back home to Grandma’s house. So, Brandi ran through the Cavanaugh’s house on her way back to see Grandma. Earlier that day, Brandi had been able to run through the back doorway as she liked, because they had the door open. However, that afternoon someone shut the sliding glass door. Brandi didn’t know, and she ran through a sliding glass door. The glass was sharp and vulnerable to breakage with not that much impact because it was not made of safety glass. Plus, it had no decals or other markings to make it easy to see if the sliding door was closed. Brandi’s mother, Terry Fitzgerald, filed a lawsuit for damages to cover the injuries sustained by her daughter. However, she did not sue the Cavanaughs. She sued their landlords, the Cestaris. Brandi’s mother argued the landlord had a duty of care to keep the rental home in a “reasonably safe condition,” which included inspecting the glass door to make sure it was made of safety glass. She argued that the landlord and property owner also had a duty to put decals on the doors to identify when it was open or shut. Sure enough, the local building code did require safety glass in the door, so the door was not code compliant. The Florida Supreme Court held that the sliding glass door in this house was a dangerous condition because it was not made of safety glass as required by the building code. The court also found that there was no way to easily figure out what kind of glass was in the sliding glass door, so it was a “latent defect.” Meaning, it was a hidden defect, and that landlords do not have a duty to hire experts to go through their rental properties looking for latent defects. Landlord or Tenant: Who Had Control of the Glass Door? Moreover, the court found that the landlords had no duty to put decals on the sliding glass door. 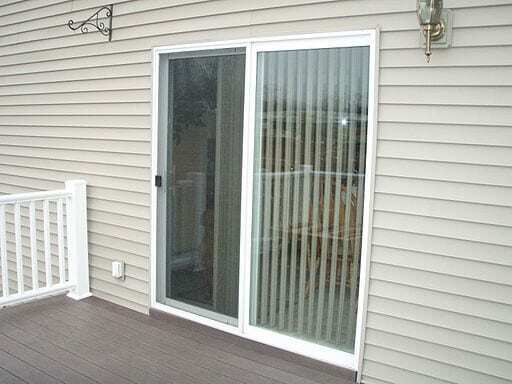 The Court explained, “An ordinary sliding glass door is not the type of dangerous condition which a landlord is in a better position than the tenant to guard against.” Meaning, the landlord was not in control of the house; the tenants were. The Florida Supreme Court found that the tenants knew there was a sliding glass door in the house when they moved in; it was far from a secret. Therefore, the tenants had the duty to warn of the hidden danger created by the closed glass door. Fitzgerald. See Bovis v. 7-Eleven, Inc., 505 So.2d 661 (Fla. 5th DCA 1987), where Florida tenants are held to have a legal duty to warn third parties of dangerous conditions on the residential premises because they are in control of the premises, not the legal owner. To summarize: in a residence, the people who live there are responsible for making sure that everyone is kept safe from the danger of a sliding glass door injury. Ordinary glass doors are not ‘dangerous conditions’ where the law holds the landlord responsible to guard against harm. What about commercial establishments? Florida courts have held that store owners are not automatically liable for glass door accidents, either. In one case, a grocery store, X-Tra Super Food Center, had automatic sliding glass doors for the convenience of its customers. The doors operate on electric impulses and motion detectors, and make it much easier to push a cart out to a customer’s car after they have purchased their groceries. In this case, the “electric eye” malfunctioned. The glass door stopped and became stationary. As a result, Laks hit the door and was hurt. According to the court, the glass door was not considered an inherently dangerous condition. The store owner was not liable for “… freak injuries that were utterly unpredictable in light of common human experience.” Id. at 503. An accident like this was not foreseeable. Thus, the court held that store owners are liable for glass door injuries if they can reasonably anticipate “the confluence of events” that allow the glass door accident to occur. Laks v. X-Tra Super Food Centers, Inc., 654 So. 2d 578 (Fla. Dist. Ct. App. 1995). Hurt While Food Shopping in Florida? The duties placed upon property owners, including business owners, landlords and even home owners, are different when a dangerous condition exists on their premises. These parties are responsible for making sure their invitees and guests are safe from danger. However, just because someone was hurt by a glass door does not mean the door will automatically be deemed a dangerous condition. An accident victim will have to show that the accident was foreseeable or the property owner had actual or constructive knowledge of a risk in order to hold a property owner liable for damages. In these scenarios, damages can include pain and suffering, lost wages, medical expenses and all other customary economic and non-economic damages associated with a personal injury claim in Florida. A good piece of advice if you or a loved one are injured in a sliding glass door accident is to speak with an experienced personal injury lawyer to learn about some of the issues that can arise with these claims, including the type of evidence needed to prove a claim and knowing how most insurance companies respond to these claims. Most car accident lawyers, like Alan Sackrin, will offer a free initial consultation (over the phone or in person, whichever you prefer) to answer your questions.